The world’s longest reef, and one of the Seven Wonders of the World, is Australia’s Great Barrier Reef. This activity celebrates the reef’s colourful underwater life which is “home to over 1500 different species of tropical fish and other variants” (Great Barrier Reef Fish, n.d.). Step 1. Create a base from half of a Poly Ball. Alternatively, you can use a golf ball sized piece of Plasticine as the base. Step 2. Insert one end of a Satay Stick into the 50mm Poly Ball (fish body) and the other into the curved side of the cut Poly Ball. This structure will now stand freely. Step 3. Paint the Poly Ball and base with Shimmer Paint. Allow to dry. Step 4. Add lines and patterns with Poscas to decorate your fish. Step 5. Use small quantities of Magiclay to shape fins, tail, mouth and eyes for the reef fish. Press onto the Poly Ball. Add Joggle Eyes. Step 6. 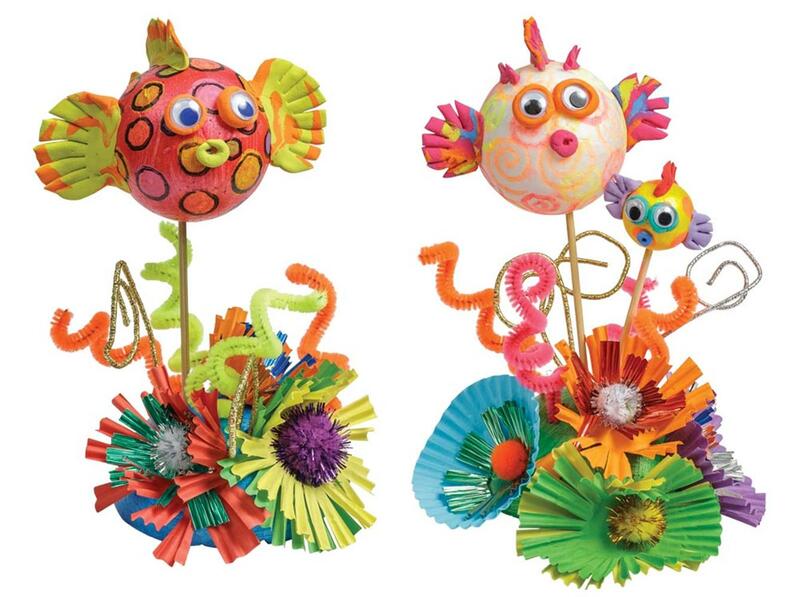 Create a reef scene on the cut Poly Ball using Chenille Stems, Metallic Wire, Patty Pans and Glitter Pom Poms. Step 7. Try twisting, curling and fringing some of the materials. Glue or pierce materials into the base to create the reef.